(Chris) We arose early, unprepared for the day because of the controversies. No one had told the manager we wanted our free breakfast early, so we got no food except stale buns we bought in Cairo. We found a ferry across the Nile at 6am and rode across in relative silence, enjoying the smooth water and breaking daylight. As soon as we landed, we were approached by many men hawking different ways to see the sights (hotel manager had already tried to sell a taxi tour and a bus tour.) Camel? Horse? Carriage? Bus? Taxi, Taxi, taxi? I said no to them all and approached the man with the BIKES, not knowing which of the T-weeds would stay with me. They all did, thank you God and St. Christopher. The bikes were about $2 each for the day - one speeds with hand brakes and a holder for a water bottle and a lock and key. We rode about, all spirits seemed to lift and the debates to be forgotten for now. We bought tickets for 3 of the best sights and, thanks to a tip from a lonely cabbie, headed to the one highest in elevation first. This way, we did all of the hard peddling while it was still relatively cool. That tell about my greatnessand so on and so on. Little did I know the first tomb (Ramses II) was my favorite. It was deep and dark and every inch was intricately carved with pictures and hyrogliphics of the type which I have seen in books many times before. 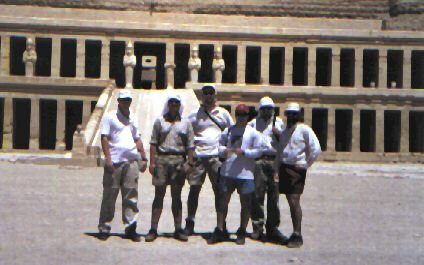 Although the tombs in the Valley of the Kings were interesting, they could not compare to the temples that we were to see later. I think that it boiled down to the fact that a tomb is a hole in the ground and a temple is a huge, awe-inspiring human accomplishment. (Sam) Habshesput" or, as we like to call it, "Sheep's Foot." (Sam) Baraka, sand and dust. Note: (Mikaela) Luxor eiegt hinteruns, endeich. Ich habe Reine Lust mehr dey eriendwelche Schenswurdi, keiten. 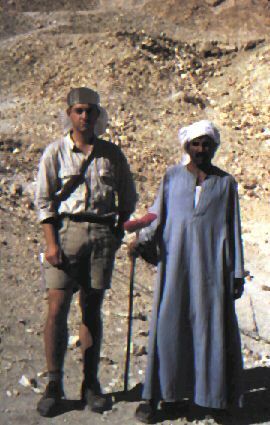 Jetit geht's noch Dahab, Schwimmer, lauel in der sonne Gielen, Hoschish vauchen und von Amerika traumen. Michaela Stockleth. (Sam) Egypt is the hub for the production of dust. The Egyptian government ships it to Cairo where it is exported all over the world where it reaches its final resting place on your dresser or the top of the TV. (Matt) We left the temple around 12 noon and I have to admit that it was hot but I have been hotter. The bicycles were turning out to be a huge success. 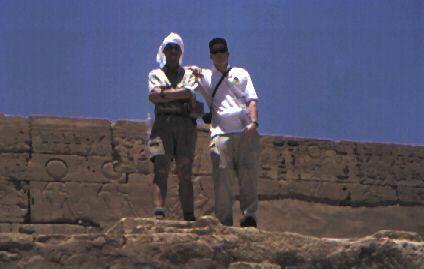 We employed gravity once again to make our way to Temple of Ramses III, "Habu." I had been twice disappointed that day by the lack of information and (I'm embarrassed to say for the sack of our keen minds) lack of historical perspective we Tumbleweeds had for the region. So, when we arrived to the temple, I asked some local blokes (I didn't see any Sheilas to ask) if anyone could be our guide. I wanted more information. Well, there was this guy who wanted to guide us so Dave and I followed him up some stairs to see what he had to say. He told us about the room, which had been Ramses bedroom. 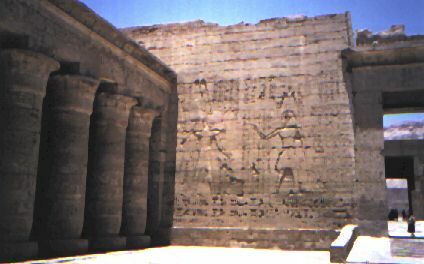 There were carvings (much faded) of Madam Ramses head (six of them) outside of his bed chamber's window. We found out later that he knew here there but she would not sleep there. She slept in a nearby store (naturally) building that he could see easily and call to in need. What a novel idea. Wife in a different building. Keep that in the back of your mind, my friends. Well, Dave and I were still the only ones there and Dave had asked him a few times to repeat himself so he told me to translate his broken English to Dave. The other guys were laughing at me for being taken in by another hustler. So I asked him how much and settled on 5 pounds ($1.60 US). Well, he took us all over the Temple, taught us a little hyrogliphics, showed us the symbolism and was fantastic. At the end of the temple, everyone was listening closely and enjoying it. To me, the most interesting part was the carvings telling the story of a war in which Ramses defeated his enemies and cut off their hands in one, tongues in another and men in the last. Wow, serious guy. All in all that guy made my day. He gave us alot of detailed explanations (for example the one armed and one legged god of fertility: the pharaoh went to war for 16 years and when he came home, he said to himself, "I've been gone for so long. Hmm... there are too many children, how can this be? He asked around (specifically, the queen whose children they also were) and discovered that they were another man's... not his. It was as he expected. Mildly upset, he asked the fella, "Why did you do this thing?" The man (clever man) said, "To make more peoples to send you help in the war." I'm not sure how the pharaoh took the explanation because he cut off the man's left arm and left leg but named him the god of fertility and he did not cut off the man's man (as you would expect.) So you, the reader, make the call on the Pharaoh's feelings. We ended up in the back of the temple and he told us to climb the stairs to the ruins of the roof. But when I gave him the five, he said, "5 OK, maybe 5 more." I was taken aback he didn't try to cheat me and gave him the 20 pounds and took back the five. Then amazingly, he said, "OK, cafeteria change," which means, "My friend let's stroll together to yonder cafeteria and I'll get you the ten pounds change you deserve." Amazed again by his lack of greed (and efficiency with words), I let him keep the twenty. He was very grateful and thanked me profusely, saying, "Thank you." (Greg) With that, we parted company with our guide and had a lunch of spaghetti at a cafeteria across the street. It was nice to rest in the shade and eat before the hot ride back to Luxor. After lunch, we all bought turbans (except Chris) and the waiter taught us to tie them. 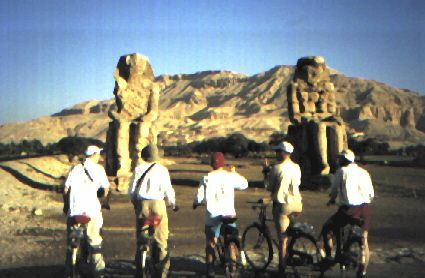 A bike ride and ferry back to Luxor and we were back at our hotel for a well deserved siesta. It was nearly 7pm when I went around waking up the T-weeds for dinner. We discovered a buffet across the street at Shady Hotel for about $5. It was expensive for Egypt, but the bean soup, egg plant and fish was delicious. At the table, talk turned to liturgical matters and all enjoyed the discussion which lasted for about 2 hours. Two of the guys went to check on bus tickets and we were off to bed.